When money was primarily gold and silver plus fiduciary media (convertible currencies and checks), to that extent it was wealth and facilitated the exchange and production of other, more directly usable wealth in the form of capital goods and personal goods. For many decades that system worked very well (promoted prosperity) in the most developed nations. The same cannot be said of irredeemable paper money, especially when issued by government agencies (central banks) facing an irresolvable conflict of interest; such agencies claim that they are guardians of monetary and financial stability, but in fact they’re committed institutionally to facilitating both cheap and non-tax forms of financing to profligate (deficit-spending) governments. It’s this latter system that we’ve had, globally, since the early 1970s. Our current, inferior monetary system — if indeed the compliment of a “system” can be ascribed to scores of irredeemable, “floating” national monies — rests in large measure on the 17th-century mercantilist notion that more money means more wealth or can create more wealth. Belief in the fallacy might have been understandable when money was gold and silver, but it’s inexcusable in the recent, contemporary (50-year) context of irredeemable fiat money. Fittingly, the current acolytes of futile monetary mercantilism call their approach “modern monetary theory” (MMT). It’s neither modern nor valid; it’s old (pre-classical) and a reversal of causality: in truth, production creates real money, while fake money impedes production. Figure One can help make the point by illustrating the empirics of money, inflation, and production in the U.S. since 1959. 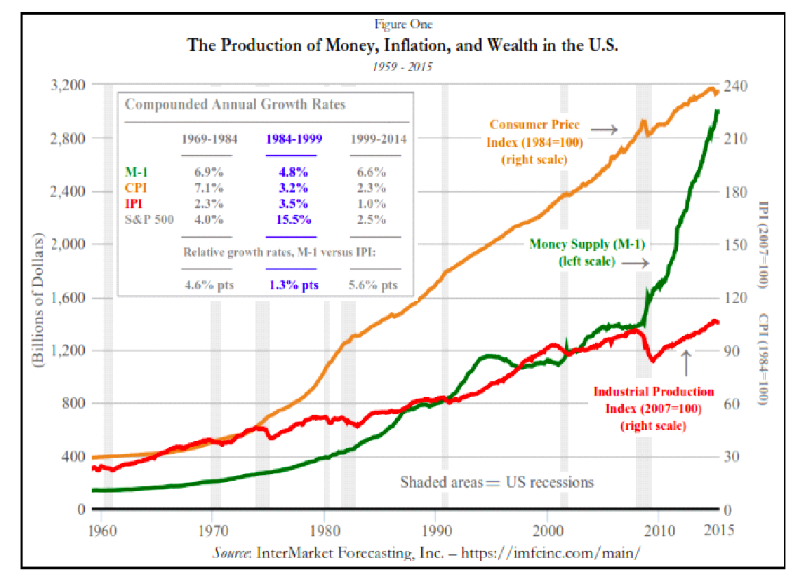 Notice that prices have increased by more than the money supply and the money supply has increased by more than output. Wouldn’t the reverse be better, with output rising faster than money and prices? We’d be able to afford and possess more usable wealth. Who needs more paper money that becomes worth less each year? Why should anyone prefer a monetary system that makes the cost of living (prices) rise faster than the standard of living (which is only made possible by real production)? In the U.S., the gap between the pace of fiat money creation and the pace of real output has widened and worsened since 2007. Yet fiat money creation has remained the preferred policy prescription not only of the MMT acolytes but also of the Keynesians (see especially Paul Krugman) and the monetarists. Euphemistically, they call it “quantitative easing” and central bank rates “at the lower zero bound.” It’s still the myth that lots of cheap money and credit create wealth. Japan has enacted the same mercantilist policy since 1990, after its stock market crashed, imposing innumerable “stimulus” plans, all welcomed by Keynesian guru Krugman, who has advised precisely the same policy for the U.S. Is Japan a good model for the U.S.? In the decades since 1990, its money supply (M-1) has increased by 637 percent while its public debt has jumped 652 percent, rising from 38 percent to 225 percent of GDP. Japan’s real GDP has risen by only 1.1 percent per annum over the past 28 years, compared to 6.1 percent per annum over the prior 28 years (1962-90), when its national debt averaged less than 30 percent of GDP. Industrial production has increased by only 0.5 percent per annum since 1990 versus 5.5 percent per annum over the prior 28 years. Krugman and the mercantilists attribute Japan’s “lost decades” of economic stagnation not to the depressive “stimulus” schemes inspired by Keynes but to insufficiently high inflation. It’s true that Japan’s retail price inflation has been near 0 percent per annum since 1990, but it’s not as though Japan has been suffering a massive, 1930s-style deflation (-11 percent at the worst, in the U.S., in 1932). The largest one-year price decline in Japan since 1990 has been only -2.5 percent (in the year through October 2009) — a brief drop in the cost of living that gave some relief — and fewer than half the years since 1990 have seen price drops (averaging just -0.6 percent per year). One defies economic logic to claim the Japanese would benefit if only they suffered a higher cost of living, or to imply that output might be boosted if money is debased. Nebulous inflation suggests that when Japan’s monetary central planners keep printing money, people keep demanding and hoarding it; the demand offsets the supply. What has this got to do with creating real wealth? Not a thing, except perhaps that the hoarding reflects an insufficient incentive to produce and spend; regardless, the money printing and money hoarding persist. The creation of money doesn’t create wealth, unless money itself is wealth — as it was when it was gold and silver. The sooner we learn this lesson, the sooner we’ll be able to revive real, robust, and sustainable wealth creation. Over the past 50 years we’ve suffered a scarcity not of money but of wealth; we’ve suffered not from a declining but from a rising cost of living. No one should be fooled into believing that the cure for economic stagnation is more fake money.